The Slow Death of Vintage Skills? We Must Stop It and Save These Skills! The Slow Death of Vintage Skills? Vintage skills – are they all but lost? I often wonder in this busy, non-stop world, how the simple vintage skills of our past fit in. When I say ‘slow death’, I simply refer to the decreasing number of people that engage in these activities. I feel like I am part of a mission to keep them going. Queenie & Ruby making bobbin lace. I was watching an episode of Lark Rise to Candleford last night and it got me thinking (gasp). In the episode Queenie brings her handmade lace (bobbin lace) to sell at the local dress shop. The shop owner tells her they will no longer need her lace because they’ve been convinced that is antiquated; machine lace is the future. Later we see Queenie making some lace when the dress maker pays her a visit. The dress maker is motherless and Queenie had no daughters, so she begins to share stories and skills on bobbin lace. For some reason this scene brought tears to my eyes. I thought about it for the rest of the night and found myself still thinking of it this morning. In a generation full of technology are we watching the slow death of vintage skills? I hear more today, than ever, about the trouble with children and teens. Could it be they, we, lack a sense of connection? Not just to one another (don’t get me started on families eating with phones at the table) but to a purpose. Have we a connection to creating the world around us? Let’s start with education. 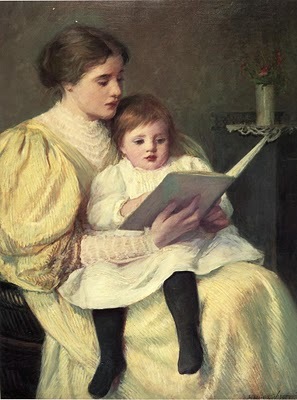 There was a time where parents, mainly mothers, educated their children at home. Not only out of necessity but because it was expected; it was the norm. Children learned to read on the laps of their mothers or around the kitchen table; all the while watching and being part of her day-to-day life. Now our children spend more time at school than at home during their week. They spend more time with their peers than any generation before them. They lack the connection to wisdom and maturity that once existed. I am not saying today’s modern homeschooling could perfectly model the past, or what fix what ails our society. But I will say it is a marvelous start. I’m a homeschooling mom…but more about that in another post. See my book Homeschooling Fundamentals. generation in time. Convenience food lines the shelves at the grocery store…even the ones considered “health food stores”. According to Michael Pollan, author of the Omnivore’s Dilemma, Americans spend 27 minutes or less a day cooking…. We have lost an art form in the preparation of food; not to mention our health. I for one can admit there was a time where 2-3 meals a week contained Cream of Mushroom soup from the can. Since going Paleo/Primal I have cooked a lot more from scratch than I have in years. But you don’t have to go Paleo to bring back the vintage skill of cooking real food. Check out fellow homesteader, The Elliot Homestead’s book, Cooking From Scratch. But I know all to well how a busy schedule can keep us from a home cooked meal eaten around a table… Skills that have nearly disappeared in the kitchen – canning, fresh baked bread (machines don’t count), making delicious stocks. wanted to pass these skills onto me but I didn’t see the value in them then. I sure do now. I have tried picking up the skills, I sew, but not well. My knitting and crochet skills are still lacking and I’d love to embellish a shirt. Even more, I would give anything to have that time with her; and to be able to pass those skills to my 3 daughters. homes. Everyone grew and ate from their garden. During war times we were encouraged to keep gardens and chickens as a means of patriotism! 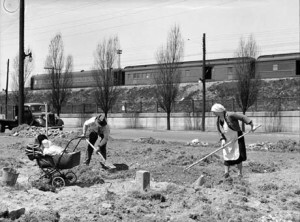 Families spent time tilling, planting, tending and harvesting from the soil. I call it dirt therapy. 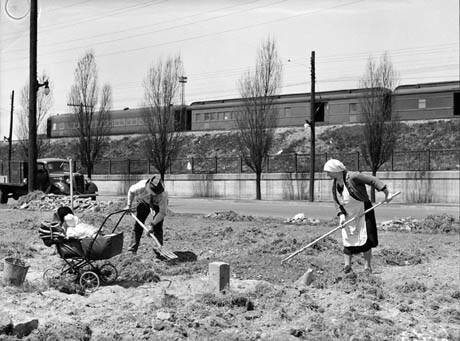 Sure it was work, hard work; but in replacing it was factory farms and grocery shopping what have we lost? Nope, no soap box on GMOs today. There was a time when we relied on each other. There was time when we were connected to each other and our food – as families and as communities. BUT! I see a revival!!! Homeschoolers. Backyard Farmers. Crafters. Survivalists. Homesteaders. These movements are growing and beginning to cross paths. They are cool, hipsters, conservatives and hippies. This “vintage revivalism” is gaining momentum. I am glad to be a part of it in my small way. I hope to only grow in my skills and pray my kids will find some enjoyment and enthusiasm in joining me in them. There is a saying that every old is new again…what do you think? Can we agree to share our vintage skills with other and continue to learn vintage skills from other? YES! Let’s do this! « Roast Chicken for Dinner? I was raised by parents and grandparents who taught me the old ways. As a young man I was expected to learn the building, farming and meat processing skills as well as basic sewing. Today, I can do these with proficiency. I have made every effort to pass these along to my daughters. A right of passage for boyfriends is participating in one or more of these activities…not many have lasted very long. Most are more into their cell phone and gaming. Oh My, now I am feeling old. I was brought up and taught how to raise a family, keep a home and see to a husband. 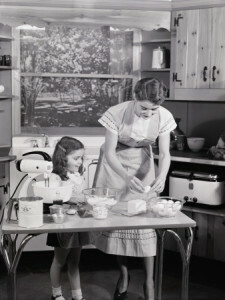 I was taught to sew, clean, cook and bake all by scratch and I have taught all of this to my one child. He is just 31 and because of this he finds it hard to find anyone to date that is even close to being compatible in his age range, but this is what happens in this day and age that most females don’t even know how to clean their own space much less cook or bake. Now where does this leave those we teach these basic lessons of life? I would love to hear back from you. Maybe he’sll find a lady that would love to spend a lifetime learning from him and sharing in the joy vintage skills. Also, I’m sure there are new things he can learn along with a lady. As the teacher. My son’s were taught lots of this stuff growing up. My son has to cook for his family and work. But his wife learn the art and now she is a wonderful cook. Well said, I’m , divorc3d, and have tried to find this kind of person in the female gender. I’m a real country boy needing a real country chick. I’ve had a very successful career in law and business , now I’m retired and trying to enjoy what life I have left. I married a city girl with book smarts and that’s how my kids are too. I love thgem all but none can relate to my real self as a country guy as I was made from. Oh Jeeze, you are in the same position I am in with my son. My son is 31, how old are your daughters? LOL they are seriously a rare breed! I sew, quilt, crochet, can, garden, cook from scratch almost every meal, etc. My 2 children ( my son is 4 and my daughter is 2.5 ) help me and love it! I plan on homeschooling as well, but for the time being, I’m finishing my degree in agriculture. I even worked my homesteadiness ( yes I just made that up ) into my speeches for my public speaking class over the summer. 🙂 I’m a happy homesteader. Carrie you are rocking it! We need more of you in the world sharing these skills! Well done. We need parents like you! I’ve been hooked on learning “vintage” skills for as long as I can remember. I think that reading the Little House books probably started it! lol I learned basic embroidery stitches from my Grandma, and basic crochet. I’ve really developed my hand sewing and embroidery skills but have gotten away from crochet. Learned to knit from a DVD but haven’t done any in a while -would like to get back into it! I’ve enjoyed doing cross stitch too. I also do paper crafting. But still struggling to get confidant on the sewing machine! We garden every year, I can (water bath and pressure) and I also put up produce from U-Picks in the summer/fall. Cooking from scratch is a struggle as I work full time, but we do pretty good. I don’t buy a lot of convenience foods. I do freezer cooking and that helps with weeknight meals a lot. I’m always happy to find others with the same interests! As a young girl of eight, I saw a woman tatting at a pioneer day event. I sat there all afternoon and watched. Later, my mom arranged for her to teach me. At fifty I was in a nursing home recovering from an accident. I saw ladies selling their creations. Maybe we could visit the nursing homes and let the wise teach us. In turn we could help them make some money or pass the knowledge on. Now, I’m 53 and researching my “roots” and I have a great legacy to pass on. I’m glad I have six children. My goal now is to teach the grandchildren all the skills I have. I’ve taught my kids about God, home management, money, and life skills. I neglected the sewing, canning, tatting, knitting, crotchet, and other skills I know…I was tired. But wait …I’m not dead yet! I absolutely LOVE that idea! I worked as a CNA (many moons ago) in a nursing home; I can tell you many of the folks there would have welcomed visitors that wanted to learn skills from them. I’m actually tearing up just thinking of this! Brilliant!!! I have 3 grown sons with families of their own now but when they were young and living at home, I taught them to cook and told them it was because they did not know if they would have a wife that cooked and besides they had to cook in college. Well, I was right on since all 3 sons married girls that did not cook, do housework etc. All of my sons were the bread winners but also the mommies of their families with doing the cooking, cleaning and child rearing. Perhaps it was the time, not sure but thank the good Lord my grandchildren had fathers that could do those chores and actually loved the cooking part. The youngest even wanted to be a chef and cut up my wonderful cookbooks for the pictures. ARGGHH The only grandchild that cooks now is my youngest son’s (the one that wanted to be a chef) daughter. I do not understand the youth of today that only is interested in taking selfies and talking on their cell phones. They have lost so much. The schools have not helped this situation either by not teaching cursive writing and so many essential subjects in school and teaching “common core”. Where are the parents to allow this? It always goes back to the parents or the parents parents. My blessed grandparents raised me and taught me everything that is good in my life. My biological mother had no interest but I sure did. That is probably what is wrong today, The parents just don’t want to be bothered or else too busy with their own interests. Sorry I took so long. Grandchildren. Like you, I would love to pass some of my knowledge on, although not as extensive as yours. I, too, practice as many vintage skills as I can. For those skills I haven’t learned, I’m collecting instruction books before those are lost too. With the pace of the world around us, we may not have the skills when called upon, but the least we can do is have some instructions. I completely agree! I’m also collecting books about how to do things I don’t know how to do…yet. If something happens, I can teach myself. In the meantime, I’m learning everything I can! Hand writing is also becoming a vintage skill it seems. About the only thing people know how to write these days are their names. I do calligraphy and to me seeing the ink and letters come to life is ethereal. Like seeing the mood, thoughts of the writer in that moment. I agree. As a homeschool mom I do teach handwriting and cursive handwriting. I’m happy to hear that! I’m teaching my grandaughter cursive, her scholl has “phased out this skill ? I teach this as a homeschooler too. I substitute High School. One day I found out the class could not read or write cursive!!!!!!!! I was shocked!!!! My grandmother taught me to make quilts as soon as I was old enough to tie a knot. She had to stand me on a chair to reach the quilting frames. She also taught me to cook. We lived 3 blocks away and I spent every Saturday with her. She also started teaching me to make rag rugs as soon as I could rip the fabric. I sew, knit, crochet and embroider. An engineer by education, I apply that training to making my own patterns. Then I took things a few steps farther and I spin my own yarn and weave. Soon I will even be raising my own animals for the fiber to spin. My husband and I left the suburbs a few years ago for a more simple life in the country. We work our professional jobs, he as an engineer and I as a project manager. Then we work our homestead evenings and weekends. Yes, people think we are crazy. But we have found more meaningful life. We have a large garden which feeds us year round as we can and freeze its bounty. We raise chickens for eggs. Eating out is a very special occasion as it means a minimum of an hour drive time. So we eat cooked from scratch meals, even after a ten hour day at the office. I bake our bread from scratch on the weekends, both yeast bread and sour dough. We even make our own beer, wine and hard cider. So the vintage skills are still alive and well here. But best of all, our daughter, niece and nephew are all learning those skills too. So they will pass to another generation. This is great! BUT. . . It is almost a this or that. I do not believe that we can do both. You talked about homeschooling and it was a norm 100 years ago, ya and people only knew what Thier parents knew but they soaked up many more things from the day to day tasks. But this is not the case anymore. Ya you can have a garden but it not supplying your family with all the food they will eat. A garden now is almost a luxury item. Not everyone can have a garden not everyone can tend to a garden. We don’t have to. Not everyone can see. We don’t have to. It is all about “have to”. Now you have to have job to pay for your mortgage that is half of your income. Now you have to go to the grocery store for your food because you spend all your time at the office so you can get paid money to pay for your house. Now I am not blaming it on the housing but. If you don’t want to buy clothes you have to make them. If you don’t want to buy food you have to grow it. See it is all about have to. Charney you are right, about not having time, but, you can still make little changes…i work driving non stop daily as i delivery auto parts but i still prepare my meals from scratch and my bread. I prepare my meals on the week ends and store them in freezer. I learned how to knit, crochet and sew at school when i was 6, long time ago they use to teach in schools those arts, and at home i refined those arts with my mom that was making my clothes from scratch. I learned to cook from my mom and my grandma because it was what we use to do…watching and learning…now our kids watch tv, play videos, socialize in Facebook…and we do it too..we call it network…but we sacrifice the time to share at the table we our family…no more regular meals together..everything is done with rush…do you see my point? We can change that slowly..i did. Make a plan in advance and set some rules. Ask help in the kitchen and share your recipes with your kids…pass it on..i thought how to knit to my 21 years old son and he was amazed and he learned to sew too..he feels indipendent. He learned how to cook when ge was 5 same as my daughter that now is 34. I tried to teach her to knit and crochet when she was a teen and she didn’t like it. 10 years later she came to me with regrets and wanted to learn. She makes scarfs, hats, mittings , all things that everybody buy in stores but we use to make ourself. She works 12-16 hours a day and she still finds spare time to knit…do you see what i mean? Find that spare time to enjoy youself making something valuable for you and your family..i still have my grandma doilies and mine when i was 14…i am 54 now and when i see them lots of good memories…your kids will have the same..pass it on. I learned to knit, from my grandmother. I always wanted “store boughten” clothes and bread, but now I make my own. Not a great sewer but can makes skirts easily. Along the way I’ve taught myself to crochet, quilt, cook, garden, and some woodworking. My kids don’t understand that not all their friends get home made biscuits or waffles for breakfast every day. This weekend I’m off to cheese making, and I want to make my own soap…..soon! I love nothing more than the smell of home cooked bread wafting from my kitchen. My aunt gave me such and easy recipe. 4 cups cake flour (or 3 and one of karakly or nutty wheat) 2.5 teaspoons instant yeast; 1 tsp salt, about a cup of Luke warm water to form a softish dough. Cover and leave to rise in warm spot for about 1/2 hour. Transfer to buttered bread tin and put into a cold oven. Switch on temperature to 350/180 and cook for approx 1 hour. If you need to put on grill at the end to brown the top. Remove from oven and tip onto cooling rack. And wipe a blob of butter over the top. Now wait a little will for it to cool somewhat before to ploughing into it? I sew, cook, I can crochet not well but can. I teach both my girls how to do these things starting from a baby. I agree that it needs to be done more. A lot of kids today would be lost if something happened and they had to fend for themselves. Ĺovely article. From someone who has almost always cooked from scratch etc. Thankfully my son is doing his beat to also teach my grandson. I do have one question. As someone who makes bread by hand and has a breadmaker I wondered why the statement that the machine doesn’t count? I use the same ingredients just have the machine do the labor for me. As I get older and my Fibro and capital tunnel (induced by being a professional knitter and a sewer) get worse i rely on it more. I prefer by hand and love the feel of the dough as I knead it. I’m just interested in your statement. I completely agree with your article our kids are missing so much that makes a difference. The reason the author says bread machine doesn’t count for knowing how to make bread from scratch is that many people who know how to work a bread machine, don’t already know how to make it from scratch, and so in an event where we don’t have electricity knowing how to use the bread machine won’t be a helpful skill, whereas knowing how to make it from scratch will be helpful. I do decently well with gardening and canning (though I don’t yet preserve as much food as I would like to). My grandmother attempted to teach me to crochet when I was younger but that’s a skill that I need to revisit now that I’m older. My granny passed away a few weeks ago and left me her vintage *working* sewing machine. She was a seamstress her whole like and made gorgeous clothes. I’ve never had much skill in it but sewing it one thing that I really am going to try to teach myself to do in the next year. My boyfriend has already requested a quilt. I’m so sorry about the loss of your grandmother. Treasure her sewing machine! I have my Great Grandmother’s machine as well, it’s a Necchi from 1940’s. It only does straight stitch, but its the smoothest straight stitch ever! I live in fire prone California and two summers ago we had a fire getting a little close for comfort. Besides my documents, pictures, and jewelry, only her Necchi was chosen to go (out of my three machines) in case of evacuation. She made 55 years worth of clothes, quilts, and love on this machine. I am blessed to be chosen to have it! My great grandmother taught me how to crochet one summer while she was visiting us, and I am so grateful for that! I still have the afghan that I finally completed. I was 15 years old. I love making tablecloths using doily thread today. I also began sewing at that time. My mom would make our clothes while I was growing up and also barbie clothes. LOL I never liked to make barbie clothes because of how tiny they were, but I did put myself through nursing school sewing anything and everything for other people. During my three years in college and all the sewing I did, I went through two sewing machines! Millions of women still knit and quilt and crochet. You can learn how to do all of these things online if you don’t have a shop with classes near your home. Do we all do them exactly as they were done 200 years ago? Of course not. We take advantage of new tools that make it easier to make the finished product but still produce a handmade item. My parents were in their mid 40’s when they adopted me as a baby, so I was blessed with hearing stories about how they grew up in the Depression Era and what they did to survive it. A couple of weeks ago, I discovered a type of lace-making called Tatting and I’ve been feverishly looking for patterns and watching what few videos there are on the subject. I bought tatting needles and a shuttle and special thread and made my first motif. Posted it on FB and my cousin (who is 20 years older) told me my mom and his mom (sisters) knew how to do that! It made me sad that she never showed me and that I can’t share with her what I’ve learned. The John C Campbell Folkschool has classes in tatting and many other crafts. It’s a beautiful place and a wonderful resource. Now part of this is very annoying. Crocheting and especially knitting are very popular. Did anyone see all those pink hats worn by the protesters in January 21? Those were hand knitted or crocheted and many by the marchers themselves and by YOUNG PEOPLE. Ravelry is a knitting, crocheting and spinning site with over a million members. I don’t know about tatting and bobbin lace making. But please quit bemoaning the death of knitting because it’s not true. Sewing is making a comeback too. People learn these things online and there are many, many how-to videos on YouTube. There are sites like Craftsy that teach these skills. There are all these independent yarn dyers–they must be selling to someone and it ain’t all grandmas. There is a revival in some circles but my article points the the population as a whole. A few years ago I picked up tatting, after I saw it introduced in a beading book as a technique that works with beads. I love it so much. I have come a long way with it, and I have started making jewelry and such from it. A lot of people have never heard of it, assuming the term is related to tattooing. Some women remember their mothers or grandmothers doing it decades ago. But it is also getting a bit of a comeback in the Artisan Crafter community. I see some gorgeous pieces out there, and I am happy to see it is not being forgotten. These are not being lost, nor are they dying a slow death. You can search FB for groups on every skill that has ever been known, and find someone who is doing them today. I just taught myself needle tatting, and know many who do that as well as shuttle tatting. I have a friend that works up beads on looms for bridles, earrings and the like. I make hats on looms, have friends that crochet, knit, weave baskets, make soap or candles, you name it, someone is doing it. As for gardening? Have you somehow missed the SBG movement, straw bale gardening is the way to go. More and more are getting into beekeeping, herb drying. I practice vintage skills. I sew clothes,dolls, quilts and home goods on my vintage machines. I cook almost everything from scratch, I garden, raise chickens, ducks, rabbits and bees. I water bath and pressure can a lot. I am working on expanding my skills by setting up a root cellar for produce and a perennial veggie garden. Im 34 and still learning. Im interested in weaving and making my own linen and wool fabrics. Im just not sure I have the space for a latge loom tight now. You don’t need a large loom to do those things. There are smaller tabletop looms and even folding floor looms that take up only a small amount of space and are easily stored but are still very versatile. You can buy them new or check out Craigslist in your area as people often start with the smaller looms and then move up to larger ones. My mother learned all the needlecrafts as part of her education in eastern Europe. 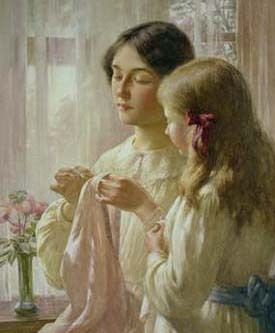 She sewed all our clothes when we were little, knit and crocheted. She didn’t need a pattern to knit anything, she just sized you up and would start knitting. But she was not a teacher. 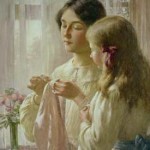 With 4 and later 6 children, a large garden, and running a household and business she did not have the time or inclination to teach us any needlework. Having said that, I do my best learning from written instructions and figuring things out on my own. I learned how to cook, garden, knit, crochet, embroider, make needlelace, quilt and sew from books and written instructions. I never considered home schooling my daughter. First of all I worked full time. Plus my math skills are not the best, not good enough to teach anyone else. I do think the school curriculum should include a class called life skills. It can start as early as kindergarten (my daughter learned how to sew on a button while at the Montessori pre school) and continue on until high school teaching age appropriate skills. Loved your blog post. I also enjoyed the Lark Rise to Candleford series. Well thank you. My youngest daughter and I have watched the entire series 2 or 3 times over the last few years. Some good points here, but I think it is a multi-point problem. When a new technology arrives, the majority of people is easily convinced that it is better, and that old-fashioned crafts are not needed anymore (making lace, for example, is much quicker and more refinde when done by machines – good for everyone with an economic interest in lace!). Once microwaves and microwaveable dinners arrived, many people were happy because this freed up time they wished to spend otherwise. In addition, time for homemade projects is becoming scarcer as we type. Instead of doing things ourselves, we pay others to do things for us because we lack either time or knowledge to do them ourselves. For some people this is great because society benefits from their skills in other areas – let’s think of surgeons or midwives, for example. For others, it simply gives them more options concerning what to do with their lives because they don’t HAVE to be a farmer/housewife/spend their time knitting socks for thirteen children/ … The downside to this, of course, is that we have to scramble and earn the money to spend on all the things we cannot do ourselves. Fortunately, I have always been interested in weird crafts, and have picked up at least basic skills in most areas. As a teenager I used to stitch gretting cards; I know how to sew a basic (slightly lopsided) skirt, knit socks, repair tears in most fabrics, and have started making a woolen blanket with some fancy patterns – if only I had the time to complete it! Also, I love to garden, or in my case “to balcony”, and cook most meals from scratch, including homemade bread if the fancy strikes me. Eventually I would love to learn how to butcher small animals (chickens, geese, rabbits) – not necessarily because I have to, but because I want to know how it’s done properly (with the assumption that if I cannot do it myself, I will become a vegetarian). Having said all that, I spend most of my waking hours as a medical translator and writer, and am eternally grateful to all those people who sew my clothes, knit my socks, build my chairs etc. so I don’t HAVE to do all this, and can instead use my language skills in a way that benefits more people. Don’t forget the vintage music skills such as playing 2 finger banjo,old time mandolin,and fiddle. Home made music was very important in generations past. I teach banjo & mandolin on Skype. Indeed! I love the sound of both of those instruments! What an amazing thing you do to teach via skype! There are many many people who do these things. Perhaps it’s because I grew up in a reenactment community that I’ve known for the past 20 years of my life that these are normal skills. I know that I really learned to love cooking from scratch when I became a Pampered Chef consultant. And now other people enjoy it too. It’s a benefit. I don’t think they’re from a bygone era, just like I don’t think writing letters with a quill and free ink are from a bygone era. I would normally say that it’s just my experience, but even non-historical friends of mine make their living sewing (including hand sewing), fixing vacuums, farming, hunting, fishing, and knitting. I know people who weave their own textiles and make their own leather works (from the cows and goats they raise). I even have a friend who makes bobbin lace by hand for extra money. I think that people are getting tired of too much technology. The idea of put down the phone is becoming more accepted than having it in your hand. I think people are becoming bored with fast technology and want time to slow down, like it used to be. And now with helpful tips and tutorials on YouTube, anybody can really learn to do anything. I definitely see your point, but I think that if people look just to the edge of the society that they know they will see that these things are still done plentifully. I think that modern technology is doing as much to save the skills as replace them. When I learned how to knit from my grandma I was a child and forgot. In a VERY rural area and no one nearby, I relied on the Internet and books to help me re-learn. However, it’s often the most simple practical things that aren’t taught: How many kids can sew on a button, iron a shirt, or hem a pair of jeans? “Fast Fashion” (great documentary by the way) made me really re-think my wardrobe. Now I keep thing above or beyond our out of fashion because I like the fabrics and they are well made, a rarity in the fast-fashion world. Not every skill needs to be kept; and there will always be those who know how to weave and sew and quilt and knit…because it speaks to connections to family, earth, friends. There are also historical groups like NSSA, which does the Civil War and SCA which does the Middle Ages and Renaissance. In SCA, I not only knit, crochet and sew, but I also spin, weave, braid, lucet and more. I am a silversmith, although I learned that before I got in SCA. I have Scadian friends who are brewers, vintners, blacksmiths, and make armor and much more. I either know someone or know someone who knows someone who does everything that was done during the Middle Ages. If you think these skills are dying out, you just move in the wrong circles. It was really more of a question for the general population. Yes in certain circles they are still alive and well; but if you went into your local Target or even your local high school how many would you find? I very much enjoyed this article. I spent my summers with my grandparents from the time I was old enough to walk. My grandmother started me out with sewing buttons on the dresses she made me. Darning socks was my next lesson. We used a light bulb and and darning needle. I learn many things from my grand mother and my mother. I crochet, knit, embroidery, sew, love cooking, gardening and canning. I would love to know Tatting. i learned by the time i was thirteen how to wallpaper. All three of my children learn to cook before leaving home. My two boys loved to try different recipes, where my daughter was simple things. Even with my arthritis, Fibromyagia and Parkinson I’m on my fourth set of dish towels Embroidering them in a years time. I made one set from scratch, cutting the size out from material and hemming them. My daughter who lives with me to take care of me has just got back to crocheting and is making a queen size afghan and the yarn to start another. The one thing I will always cherish from the old days is a boy doll made from material which is the size os a one year old. I remember helping my grandmother sew the buttons on his clothing. He is around sixty some years old and sits on a chair in my bedroom . Thanks for letting me share this. My mom was not one to do these things maybe because her mom died when she was young. So I did not have grandmother’s. But these are things that I have thought myself over the years. I hope that my daughter picks up on. I am not a home schooling mom but my children all learns to read on my lap, count, color, cut and basic math at the kitchen table. I garden. When the kids where little I cooked from scratch. I would love to still do this but I work a lot , leave early and get home late. I cross-stitch and still wanting to learn to knit and crochet. My youngest who is my only daughter is almost 15 and we still read together and do homework at the table. I miss the days that I was a stay at home mom and helped with homework while I was cooking dinner and had more time with my kids. I have all the Foxfire books. As a homeschooling mom I wanted my kids to be able to sustain themselves no matter what life brought their way. Not sure I completely did that. But they can do a lot of things. It gives us something to pass down through the generations. I support your efforts. I love this so much! I’ve always been into history, starting from a young girl. We were homeschooled part of our lives, and my mother read us the Little House books while my father read us the Chronicles of Narnia. My mom tried to teach me more sewing and cooking, but I preferred playing in the field behind my neighborhood–which I hope my children get the chance to as well. Now that I’m done with college, I am trying to learn how to bake more; I can make a few things, but I really want to learn more. My boyfriend is a fantastic cook, and he and his dad break down whole animals from hunting (his dad got a boar last month and one feeds both households for a good while!). I’ve also gotten back into sewing, and not only is it rewarding when you hand make something, but it’s also really relaxing for me–especially right now because I’m hand sewing my first quilt, so it’s a lot of the same easy stitch. I also wholeheartedly agree about homeschooling. As a former daycare worker, I can say truthfully that some parents really think it’s only the teacher’s job to mold the child in every way (behavioral as well as intellectual). That really saddens me. When I have children, I want to homeschool them. Once again, amazing post. I’ll have to go check out the rest of your site now! Have a good and blest day! Join the Society for Creative Anachronism — you can learn all these skills plus historical context. No need to withdraw from society or homestead. From lacemaking to armoring. We have friends that participate in this and it is awesome! I do so many crafts etc. I had a fairly old fashioned English upbringing and we didn’t have a lot of money so we had to make do with every scrap of anything we had. Im glad i have lived in these times an too was worried that the younger generations were missing out. While in there teenage years they havent seemed to be interested in anything but facebook and console games but i have been very surprised that the likes of youtube and pinterest have fueled younger people to find an interest in the things i thought might die. I think the enormous following of things like steampunk has also helped a resurgence of old world activities. Sewing and furniture making to name just twi is making a big comeback. People are getting fed up with the mass produced cookie cutter rubbish spewed out by big corporations. People are wanting more customised items to suit their style and tastes and their own beliefs on how to live. Yes time is so hard to find in our busy hectic lives but its nice to see more young people fitting in some moments to make things for themselves. My ideal grandma image (I have 5 grandchildren) is of a grey haired woman with a braid down her back and a smock/apron on in the kichen cooking and baking from scratch. I am trying to live up to that image (I don’t have the grey hair yet). I am raising one of my granddaughters who is 4. She helps me whenever she can. We do the traditional snapping of the green beans together. (A dying tradition). A while back, I learned a little bit of crocheting from my ex mother in law and how to cook from scratch. My cousin (who bought me a sewing machine) and the elder ladies at my church taught me how to sew, and I absolutely LOVE it! I need to relearn crocheting as I have not done it in a while. 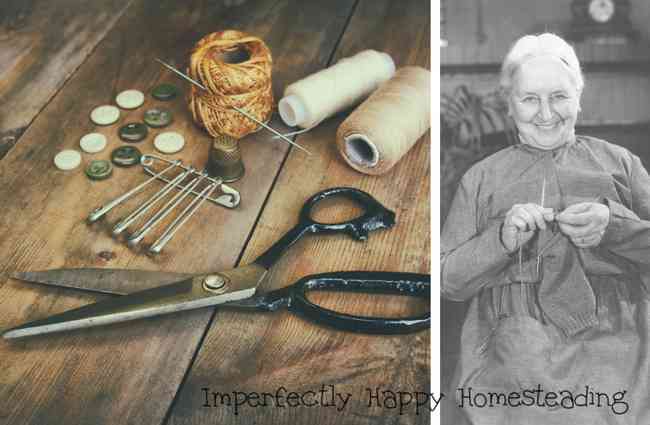 I want to learn knitting and canning yet plus all the other “homestead” skills so that I can pass them on to her and the other grandchildren. I think we need to know these skills and get back to our “roots”. I agree this is a dying art. It is our duty as grandparents (the elder generation) to pass these on to the younger generation kids, grandkids, great grand kids, neices and nephews, whatever the case. We need to keep this going. My girls have always loved the snapping of beans. I think there is something in that simple act…can’t say exactly what it is. There are some great videos on YouTube with knitting instructions but if you can find someone who is willing to teach you, that is always better. Same with canning – though the Ball Book ( https://amzn.to/2lnM9XB ) has great instructions. Actually, if you do some research and get off your “hur hur technology is bad and Steve Jobs was a witch” high horse, you’d find that these skills go in and out of style every generation or so (they’re currently “in” with Millennials, by the way). Actually I never said anything about technology is bad. My husband works in software and I’m a blogger…I have no problem with technology. Nor did I say or infer anything about Steve Jobs. What is clear is that YOU did not read the entire article because you missed the part where I said, “This “vintage revivalism” is gaining momentum”. Stop commenting without really taking the time to read through something word for word; I guess that’s out of style currently. Nice article. I raise angora goats, shear their mohair, clean it, comb it, dye it and spin it into yarn. I also felt wool, mohair and other natural animal fibers together into fabric – there is no end to how much you can do with natural fiber. Shearing the goats is the most challenging. Well, maybe difficult goat births are harder, but after a career mostly in information technology, I love being able to create things from the ground up. I love this so much! I am trying to convince my husband of the benefits of homeschooling and will definitely be sending him this post! I knit, crochet, and sew for my grandchildren, and I have taught them some knitting, crocheting, and sewing also. I also have taught all 5 to weave simple scarves on my 4 shaft table loom. They have each woven scarves for teachers for Christmas and some have also woven scarves for family members. I also bring my table loom and tape loom to a Colonial Day event at the kids’ school each year to teach 2nd graders about weaving. They each get to weave on both looms but with so many kids, it’s only about 5 -10 minutes each. The tape loom makes bands or straps, like in Colonial America. An inkle loom is like a modern tape loom. I make each child a handwoven bookmark so they can have a bit of weaving to take home. They each help weave on the table loom, and I finish their weaving and bring it back to the classroom as a wallhanging with wooden beads on the fringe ends. It’s colorful and they love it. Yes, we need to keep teaching the younger generations about these old skills. Another area that is lost on modern society is the possession and use of manual hand tools as a backup to corded tools. We’re warned daily about the vulnerabilities of our electrical infrastructure but most people ignore the warnings and go about their day. Who knows when a brace and bit may be needed in place of a rechargeable or corded drill. What if the day came where you couldn’t go to the grocery store for flour? I doubt that most people have a manual (hand-crank) mill and wheat at home. Same can be said for meat and manual meat grinders. What about water? It seems simple and we take it for granted each time we turn on a faucet. What if your well pump didn’t work because there was no electricity? In the old days people used a galvanized well bucket, but there is a modern answer to solve this problem as well (www.emergencywelltube.com). Just a few things to consider, because the right tool can be a great substitute for skills, or the lack thereof. I am a public school teacher, and I feel it’s my job to teach these skills to my students. My students and I read Laura Ingalls Wilders’ books, and have related lessons. The kids especially liked making cheese. They love it when I tell them about my goats, chickens, and bees. One student loves raising chicks, but her mom doesn’t want the chickens when they start laying. The little girl then gives the chickens to me, and I get hens that are already laying! I’m glad that I live in a part of the country where most people I know at least have a small garden. I’m thankful to have the ability to put up my own vegetables, fruits, pie fillings, jellies, jams, etc. My new project was canning some venison that my husband harvested last deer season. Some people don’t understand why I grow and preserve my own food. After all, I could just go to the store and buy it. That’s MUCH easier. They just don’t get it. By the way. This is my first visit to your blog. I think I’m already hooked! You are so wrong. The old skills are alive and well. Check out your local renaissance festival or SCA. Check you your fan communities. Check out your craft fairs and quilting communities. Check the costuming and fan groups. All those skills and much, much more are busier than they’ve been for generations. For myself, even though I did have a grandmother who crocheted as naturally as she breathed, I still had to learn on my own, As of now, I crochet, knit, sew, embroider, and bead. I can recreate nearly any historical period. In the past, when my body was healthier, I made my own bread. I’ve never mastered gardening, but many of my friends are mad mini-farmers who raise their own organic crops. I suggest you look around you. I think you’ll be pleasantly surprised. I see what you’re saying but those are small fractions of our society…I’m talking as a whole. But I applaud you for being one to keep things up!!! We are lucky right now, because there is a resurgence of Folk Schools in the United States, dedicated to trying to keep a hold of these knowledge and skills. If you are in Michigan, please take a look at the Michigan Folk School – who teaches courses on Homesteading, Canning, Bee-keeping, Blacksmithing, Spoon-making and more! Your article could do with a proofreader, but was nonetheless quite enjoyable to read. I myself, sew, preserve fruits, vegetables and meats, spin wool into yarn, weave cloth on a loom, knit and crochet, embroider, make soap from raw ingredients, garden, etc. It is nice to see so many people responding to your article with the skills they are working to preserve and pass on to others. Keep up the great work! I am sitting here working on yet another crochet project. I learned how to make bobbin lace and crochet lace and I have sewn curtains and clothing by hand. This year will be the first year I put in a really big garden, the kind of old farmer’s garden with a fence and wildflowers all around it to attract bees. In the past I’ve canned my own food, and look forward to it again. I didn’t pass any of these skills on to my son because I raised him in a city, which I regret. But soon I hope to start a crochet circle or teach a two-day crochet class to kids at the library. Never to late to pass on your skills, even if it isn’t to your son. I think it is so wonderful that you are teaching kids crochet! This is what I am starting to see in so many places. KIDS are interested in getting off those devices and doing useful things; we just need to give them the tools. My husband and I are currently looking for a place of our own, and I’ve told him that if there isn’t room for a garden and the dog that it’s not big enough. Expenses come and go, but we will always need to eat! So, with a garden, that’s one expense that will always be covered at least 85%. Best of luck searching for you place! Did you see my new post on buying your first homestead? It was just posted today. I know how to do lots of things, but having the time to do them is another story. Sewing, hand embroidery, quilting, crocheting – none of these skills have any interest for my grown children. Everyone is too busy working. My granddaughters are not interested, they are too busy looking at one kind of screen or another. I am slowly but surely trying to add hand crafted items to my own home. I hope I am still here when anyone decides they might want to learn the skills I learned from my grandmother! I agree – I wish I had those years back with my grandmothers! I disagree that there is a slow death of vintage skills. Not everyone wants or needs these skills, but those who do have plenty of access to learning them. What bothers me most about your article is that the skills you cherish are women’s skills. Isn’t it even more important that men learn masculine vintage skills? I had two sons and in addition to learning about laundry, ironing, and basic cooking, they learned basic carpentry, gardening, and simple machine repair. My granddaughter, now 17, can cook, bake, knit and sew. She is also working on restoring a vintage muscle car while maintaining honor grades and playing sports. It all depends on family choices. Gigi – I will have to disagree with you; I believe all these skills are important and needed. I have also written several other articles that include more traditionally male vintage skills – check out the Vintage Skills category. I do believe these skills depend on choices, but I also see that many people are simply not choosing the over learning “tech” skills or playing video games (men and women); I think it is a shame. Well, said. I have. Even teaching young ones “vintage skills” for years. I always tell them I just want them to know how to do things from scratch so that they can teach their children and grandchildren. I tell people I am a LOLA, Lady of Lost Arts. Thanks for continuing and furthering the teaching of vintage skills. I crochet, knit, embroider, sew and do paper crafts, I am working on my first yo – yo quilt, all handmade. I live in a large city, so I have a small garden but am able to grow fruits and vegetable. My peach trees yield so much that I am able to can peaches, make ice cream, and syrup and give to neighbors. My garden is my oasis in a large city. This article gave me so much joy! Sadly my mother didn’t teach me “traditional skills”, my grandma also does not taught it to her so you see the circle. I feel blessed to have found good blogs like this and a good amount of content on YouTube and other blogs teaching us how to cook, to sew, to teach children… Which means I’ll break the circle and teach to my future kids everything I wish my grandmother/mother had taught me. If you, visitor, are a mother, please teach your kids everything you can! It breaks my heart to see my 7 years old brother stuck on games on /his/ phone and videogames. I’m a 23 years old woman and bride and I’m trying to learn everything I should have learned years ago. I started writing a series of blog posts about sewing a month or so ago. I have heard too many people tell me “I wish I could sew!” or that they think it’s too hard, and I want to change that. Everybody should try to have a grasp on the basics! I can sew, knit, crochet, spin yarn, can, garden, cook from scratch, and have tried weaving but got too busy lol I dabble in herbalism and am learning to forage. All skills I taught myself and plan on teaching my kids. In some ways the Internet has brought many of these skills back to life and I’m happy for it! Great post. Honestly you couldn’t have said it better. My Nana Sister Mary Lou ( yes she was a nun and yes I’m aware that me being here as she had 4 boys seems a bit strange but with a direct pardon from the pope you can be a nun even if you had kids and were married, who knew) taught me to crochet at my brothers wedding about 25 yrs ago. Not only have I made about 50+ baby layettes, Christmas stockings, blankets galore, toys, clothes, and many a sweater but the memory of her teaching stays with me forever. I ran to Walmart in Pensacola FL, picked up a needle and some yarn and in a hotel room she taught me. I have now taught my daughter who is better than I. The student surpassed the master. We have had gardens, chickens, both my kids, but more my son, bake and cook from scratch. They amaze me everyday. I also homeschooled my kids from the fourth grade on and wouldn’t have it any other way. My daughter is getting her masters in accounting so those doubters who say homeschoolers don’t “really” learn are full of hogwash. We have so many a memories but also they learned some real skills as well as being able to put Math, History, Science and English skills into everyday things like baking. Why is 1/2t. instead of 1/2T. so important when making cookies for example. There are beautiful ways when you home school to implement what so many think homeschoolers don’t in terms of learning do and studying just in the everyday. The result is learning a basic school skill while learning how to feed your family and have a blast doing so. For something I have been doing for 3 decades now it’s encouraging to see a revival is here and I’m so happy to now be teaching my 4 yr old grandson the skills of life. Keep on everyone. And those who think they can’t. You can. Even in apartment living. You can have a patio garden, teach your kids to cook, learn to sew, crochet, knit, paint, scrapbook, clay art, bake, the abilities are limitless even in a limited situation. Everyone can do something. That’s the beauty of it. Turn off the tv and play a game or do a puzzle (not on your phone). Put the phone away for two or three hours so real family time can be the thrill. You’d be surprised how receptive kids are, even teenagers. Engage your kids because of you don’t someone or something else will. Do you want or invite that influence you know nothing about? Be in it. It’s amazing and can completely change a family dynamic that many would say is hopeless. Start small and build on it. Anyhow thanks for sharing something I believe is the key to getting kids off the street, off their phones, and a productive person in the future. I loved this post! Also what about reupholster’s? I’m an interior designer at a nearby Christian University and all the upholsterers I know are retirement age. Same with furniture refinishers. I can’t even find one these days! There is a big need for these things but no one wants to get their hands dirty it seems! I do love to cook from scratch. I do also like to garden and can. We need more doers and less talkers! We can, garden, raise chickens and pigs, we both can sew, heat with wood, and do as much as we can for ourselves. Moving slowly toward self sufficiency. This article warms my heart! I have three under three and am concerned for their future. My husband and I grew up on a farm and currently farm. Both in areas where we have a step up dial up internet and two bars of cell signal. We don’t watch TV. We prefer to be outside, read, use our imaginations. I love to garden, sew, embroider, cook from scratch and try to live a simple vintage life. I’m trying to receive my crochet skills and pick up depression era skills to live even more simply and frugal. Because kids and people today watch so much TV, play video games, and are overall so disconnected, I’m concerned they will be outliers and have a hard time connecting because these are skills I plan to pass to them and limit any and all media. Some media is ok but Im talking less than an hour a day and most days not anything. I would rather see them reading than playing video games or watching TV. But seeing all these comments about learning these vintage skills and passing it on to their kids watms my heart and gives me hope for my kids future. Love this article! how easy is knowledge lost? a short account of a child who went to call her mother so she could stay for dinner at our house. we had a phone on the wall in the kitchen. it had a rotary dial. it worked quite well but stopped the child as she tried to use it. she had never seen one. not a generation has gone by and still skills are lost. tools that belonged to my father have no value because they have no power. To think we lept into the air and landed on the moon in about a century. not many could drive a car made in 1920. what is so sad is when we try to tell our young about our knowledge and think it of no value. It’s so wonderful to know I’m not alone! Sure wish I had my grandpa back. He taught me to woodcarve starting with corn stalks. He and I built go carts together, and we got up at 5 to “tend” the garden, even on weekends. He gardened, raised livestock, and taught his grandchildren how to fish, hunt, and prepare any kills to eat (hunting was survival. You eat your kill, or you don’t kill it), built gocarts that had real motors, kept an old tractor running that always seemed on its last leg, chopped wood for heat by hand, pruned and grafted fruit trees…and taught us all how to do those things. And it didn’t bypass the girls either. We learned right along with the boys, much to my joy. Some of us are still listening to wisdom from our elders, or would if they were here. ? For as long as I can remember, my mama taught me the skills needed to be independent and self-sustaining. Maybe it stemmed from the fact that grandma died when I was just a first grader, and mom didn’t have time to learn all she wanted from her mom who sewed, cooked everything from scratch, and made the best pies! I know that I taught my first grade teacher to crochet (while I was still a first grader), and at 7 years of age, used mom’s treadle sewing machine (it was my great grandmother’s) to make a blouse on my own. Later in life, I made all of my own and my daughter’s clothing. I joined a craft guild where I learned many new things including caning, basketmaking, and quilting (beginning with the Cathedral Window Quilt). Today, I crochet, knit, tat, sew, garden, can, am learning spinning and weaving, and fix much of my food from scratch. I also do some wood carving, build and decorate dollhouses, play piano, and do scrapbooking. I also keep a journal so all of this will be passed down to my grandchildren and great grandchildren. You cannot put too much emphasis on connecting your children to the past. The past repeats itself. Someday they will need sustainable skills, even though they may not know it now. It’s the past that creates the future. And besides, everything now is about technology. The past was such a more genteel and classy time, full of elegance when we took time to enjoy life instead of being so rushed. In the last 3 years we left the suburbs for half a acre in the country. We pulled our kids from school, grow most of our produce, can it, forage for fruits until our trees produce, got 50 chickens, dairy goats, learned to crochet, finger knit, make quilts, and soap. We’re learning to sew and embroider by hand and machine, to make cheese, butter, and ice cream from the goats we milk. We bake bread, pies, and all our frozen and canned convenience foods. This Christmas we made all gifts by hand. It was awesome to see the kids putting their hearts into whay they were giving and being more excited to see the reactions to what they’d made than to open their own gifts. Life is so much better and our family is so much closer! I grew up on a mostly self-sufficient farm. My family raised chickens, cattle, and pigs, and had a 2 acre garden and orchard. From about age 8, I spent my summers helping with canning and freezing produce from the garden. I also did a lot of weeding!!! I learned sewing from my mother, who made new Easter dresses for myself and my 4 sisters every year. When I got my driver’s license, I drove tractor and wheat truck for my dad and uncle during summer harvest and fall planting. I learned basic mechanical skills from my dad, as a truck driver was required to lube his/her own truck. My dad supplemented his income during the winters as a carpenter, and built 3 of our family homes. He passed on many of his carpentry skills to me. I have continued to use these skills with my own family, as I became the handyman (woman). Last Christmas my family decided to do a “homemade Christmas.” Although there weren’t many gifts, they were more meaningful, because they were lovingly made by hand. I loved your article. What’s clear is that there truly is a revival and lots of like minded souls. I run a small community garden and that’s a great place to some of these people. I find it funny knitting, crochet, cross stitch, embroidery etc are considered vintage. I am 17 and I have been knitting and crocheting for 3 years and sewing and embroidering since childhood. In fact I was almost the first person in my schools history to be suspended for knitting (It was super close, Apparently yarn bombing makes me evil). To me these are just practical skills, when you can master “Vintage Skills” you can fix a plethora of things, Make a plethora of things and save a crap ton of money (and its fun). Vintage skills are definitely something that is declining, despite a resurgence lately. I learned very few of them growing up – since none of my family really did any of them. I did learn to knit and sew as a kid but lost those skills a few years later. I would love to pick those up again at some point. I can throw a few stitches in something to fix it, but they are definitely sloppy. I have started doing a lot of cooking from scratch, though it’s still a newer skill to me. Gardening has been a huge part of my life and it lead me to learn how to can a couple of years ago. I have been working on passing on what skills I have learned to my son, but I know that even I have a long way to go to learn these older skills. Technology is great and all, but I think there is something special about embracing vintage skills and I hope to add more of them to my life in the future. I was like you in not wanting to learn the old ways. I do know them now, though. I sew, knit and crochet. I was 54 when I learned to knit. I have learned to make my own bread without a bread machine. I love cooking from scratch. Especially in my crockpot. Yum. I agree. It’s refreshing to find a group of people who value these skills and traditions. Thank you for preserving our history and heritage. Thank you for teaching future generations life long skills. Vintage skills are always used in my home. I learned to bake from my grandmother, and also garden and hot and cold canning. I learned to sew in school. I learned from scratch cooking and baking from my husband and his great grandma, I learned to make quits from my mother. And I also learned to loom, crocheting, and farming work from my Dad. I love the farming lifestyle always have. I learn something new everyday. I love the rustic type of homes. Where items in the home do not have to be brand new. And you can make items with your hands.